Do you think that your office furniture looks outdated? You might need to refurbish your office furniture this year. One of the reasons you haven’t may be a lack of resources, funds that is. Instead of the costlier newer options, you should revitalize your office with used office furniture. Revitalize your Office: We can offer you high quality and affordable furniture. In fact you will find classy and elegant used office chairs and used cubicles in affordable prices. 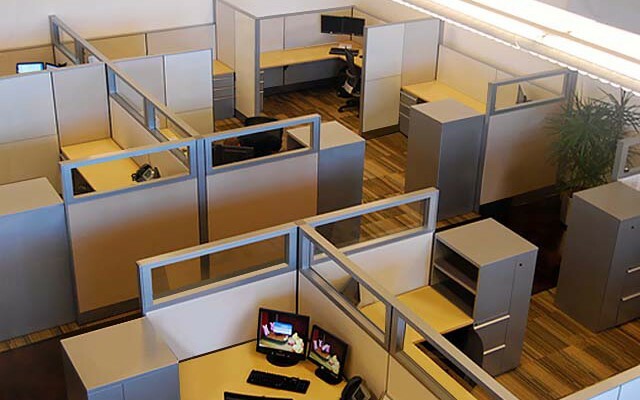 If you are searching for opulence then you will find Herman Miller’s used cubicles in reasonable prices. However if you need convenience then you can opt for used office chairs offered by Hon, Haworth and Kimball. Are you going to start a new business? If yes then you must be aware of the fact that office furniture is one of the most important parts of an office. Your office furniture should exhibit a wave of professionalism. The main items amongst office furniture include; office desks, office chairs, sofas, and computer tables. In order to make your office environment comfortable, you should use comfortable and relaxed office furniture. If you want to decrease your business’ start up cost then you should opt for branded and premium quality used office furniture. You will find branded and elegant used office desks as well as used cubicles for your office. Comfort: Your employees will definitely work better if you provide them comfortable environment. Therefore used office furniture can contribute a lot in increasing the productivity of your employees. You will certainly observe a positive change in your employees’ output after revitalizing your office with comfortable and affordable furniture. Elegant and Classy: It is wrong to say that elegant and classy furniture is only for the affluent. You can also purchase classy used cubicles, used office chairs and conference tables of premium brands such as Herman Miller, Steelcase, All Steel and many more. Body Mind Connection: It is said that your mind will not work effectively if you are not sitting properly. This shows the importance of providing comfortable office furniture to your employees. When buying second hand office furniture you must ensure that office desks and office chairs are providing proper support to your body. Demand: There is an increase in the number of people who prefer used office furniture over new. It does not only decrease their cost but it’s quality as well. There is multitude of benefits associated with used office furniture. If you want to buy affordable but classy and elegant office furniture then you should contact us today. No Comments on "Revitalize your Office with Refurbished Cubicles"